This article is about the athlete. For the Reconstruction-era Florida politician, see Robert Meacham. Robert Emery Meachem (born September 28, 1984) is an American football wide receiver who is currently a free agent. He was drafted by the Saints 27th overall in the 2007 NFL draft. Meachem has also played one season with the San Diego Chargers. He played college football at Tennessee. Raised in Tulsa, Oklahoma, Meachem played football in elementary school for the "Mabee Babies" of The Salvation Army North Mabee Boys & Girls Club. He won a national basketball title in the summer after eighth grade with his AAU team, the Tulsa Jammers. He later attended Booker T. Washington High School, where he was a teammate of future NFL players Felix Jones and Mark Anderson, and was named a high school All-American by Parade and SuperPrep reporting services. Meachem was also a point guard on his high school basketball team, which won back to back state titles in 2001 and 2002. Meachem attended the University of Tennessee, where he garnered rave reviews upon arriving in 2003. He was part of a heralded recruiting class with receivers Jayson Swain and Bret Smith. Meachem, however, redshirted the 2003 season after suffering a knee injury in preseason practice. Meachem caught 25 passes for 459 in 2004 as a redshirt freshman. He returned to play in all 13 games (zero starts) and led the team with 459 yards on 25 catches (18.4 average) and four touchdowns. Meachem was the only Vols receiver with 100 yards in a game that year. Meachem's first career reception occurred in the game against UNLV, which was a 35-yard score. Meachem appeared in all 11 games in 2005, with two starts, and again led the team in receiving yards with 383 on 29 catches (13.2 average) and two touchdowns. 2006 was Meachem's breakout year. Along with David Cutcliffe's return to Tennessee as offensive coordinator in 2006, Meachem, Swain and quarterback Erik Ainge all turned in career seasons. In the November 25th game against Kentucky, Meachem had 116 receiving yards, pushing his total to a new school record of 1265 yards in a single season. Meachem also totaled 11 scores, a career best. He also had six 100 yard games that season. He ranked fourth in the nation with an average of 99.85 yards per game receiving and ranked 24th nationally with 5.46 receptions per game. He led the team with a career-high 71 catches for a school single-season record 1,298 yards (18.3 avg) to lead the SEC, including 11 touchdowns. He recorded two solo tackles, gained 16 yards on a kickoff return and 12 yards on a punt return. In 37 games at Tennessee, Meachem started 15 times. He caught 125 passes and became the sixth player in school history to gain more than 2,000 yards receiving, totaling 2,140 yards (17.1 avg) with 17 touchdowns. All this earned him an all SEC, consensus All-American selections. Meachem decided to skip his senior season and enter the 2007 NFL Draft. 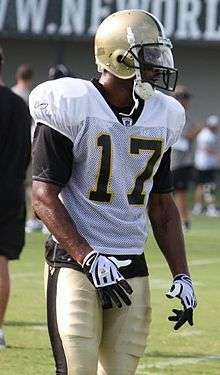 With the 27th pick of the 2007 NFL Draft, Meachem was selected by the New Orleans Saints. Meachem signed a five-year deal worth $11.3 million in base salary and incentives with $5.71 million guaranteed. However, Meachem underwent knee surgery and was unable to play in his rookie season. Meachem was once again inactive for the Saints' opener against the Tampa Bay Buccaneers in 2008. On September 14, 2008, Meachem caught his first pass in the NFL, a 19-yard touchdown pass against the Washington Redskins. In week 4 against the San Francisco 49ers, Meachem got the chance to see more game time due to number 1 receiver Marques Colston sidelined with a broken thumb. In this game, Meachem had only 2 receptions, his first a 47-yard touchdown grab, his second a 52-yard flea flicker catch with a defender draped all over him. Meachem ended week 4 with 2 receptions for 99 yards and the Saints got the win over the 49ers. Meachem finished the season with 12 receptions for 289 yards and 3 touchdowns. He also had a 24.1 yards per catch. On December 6, 2009, after Kareem Moore of the Washington Redskins intercepted Drew Brees, Meachem tore the ball out of Moore's grasp and ran it for a touchdown. In the same game, Meachem caught a 53-yard touchdown pass with 1:19 left in regulation, tying the game at 30. The Saints won 33-30 in overtime to improve to 12-0. The 2009 Saints went on to win the Super Bowl. Meachem remained with the Saints through the 2011 season. During his five years with the team he had 141 regular season catches for 2,269 yards and 23 touchdowns; he also played in six playoff games and had 14 receptions for 184 yards and a touchdown. On March 13, 2012, Meachem signed a four-year contract with the San Diego Chargers worth $25.5 million including a $7.5 million signing bonus. He was part of the Chargers' plan to replace Pro Bowl receiver Vincent Jackson, who left the team as a free agent. Meachem caught two touchdowns in a 2012 matchup with New Orleans, but he dropped a potential touchdown in a 7–6 loss to the Cleveland Browns. His time with the Chargers was disappointing, as he underperfomed the high expectations reflected in his large contract, and was compared to a previous Chargers free agent "bust", David Boston. Kevin Acee of UT-San Diego called him "the worst free agent acquisition in the history of the Chargers". On September 1, 2013, the Chargers released Meachem during final roster cuts, even though they had guaranteed him $5 million for the upcoming 2013 season. On September 3, 2013, Meachem signed a one-year contract to return to the New Orleans Saints. In the 2013 season he recorded 16 receptions, 324 yards, and 2 touchdowns. The Saints signed him to another one-year contract on April 18, 2014. Meachem was among the last cuts made by the Saints before the 2014 season. However, a few days later, he re-signed with the team on September 3, 2014, after rookie Khairi Fortt was placed on short term injured reserve. His contract expired after the 2014 season and he did not re-sign him making him a free agent. He missed the entire 2015 season as a free agent. On June 14, 2016, he tried out for the Saints at minicamp wearing the number 12 on his jersey. It was last worn by Marques Colston for 10 years. The tryout was put on hold the following day as Meachem had a foot injury and didn't practice. Meachem is a contestant on NBC's Minute to Win It in an online exclusive episode playing to win money for the Boys and Girls Club of Greater New Orleans. ↑ "Robert Meachem NFL Football Statistics". Pro-Football-Reference.com. 1984-09-28. Retrieved 2012-09-11. ↑ "'Mabee Babies' turn out super". Tulsa World. Retrieved 2012-09-11. ↑ "Farm served as sanctuary for WR prospect". ESPN. Retrieved 2007-04-09. ↑ Dubenetzky, Jim. "Meachem signs five-year deal with Saints". SaintsGab.com. Retrieved 18 April 2014. ↑ "NASCAR". Sporting News. 2012-09-05. Retrieved 2012-09-11. 1 2 "New Orleans Saints sign WR Robert Meachem to a one-year contract". NewOrleansSaints.com. September 3, 2013. Retrieved 2013-09-03. ↑ "Former Saints WR Meachem agrees to four-year Chargers deal". NFL.com. 1 2 Gehlken, Michael (November 26, 2012). "Robert Meachem reaches new low". U-T San Diego. Archived from the original on November 26, 2012. ↑ Acee, Kevin (August 29, 2013). "Meachem story: no start, finished early". U-T San Diego. Retrieved 2013-09-03. ↑ "Chargers release Robert Meachem". Associated Press at ESPN.com. September 1, 2013. Retrieved 2013-09-03. ↑ Marc Sessler, "Robert Meachem re-signs with New Orleans Saints", NFL.com, April 18, 2014. ↑ "New Orleans Saints re-sign WR Robert Meachem", WWL-TV, September 3, 2014. ↑ Katherine Terrell, "Robert Meachem doesn't practice Wednesday with foot issue; tryout still ongoing", The Times-Picayune, June 15, 2016. ↑ "Robert Meachem Stats". ESPN Internet Ventures. Retrieved 22 May 2014. ↑ "Breaking News - NBC's 'Minute to Win It' to Air Special NFL Themed Episodes September 7 & 8 Leading Up to NBC's NFL Kickoff on September 9". TheFutonCritic.com. 2010-08-19. Retrieved 2012-09-11.